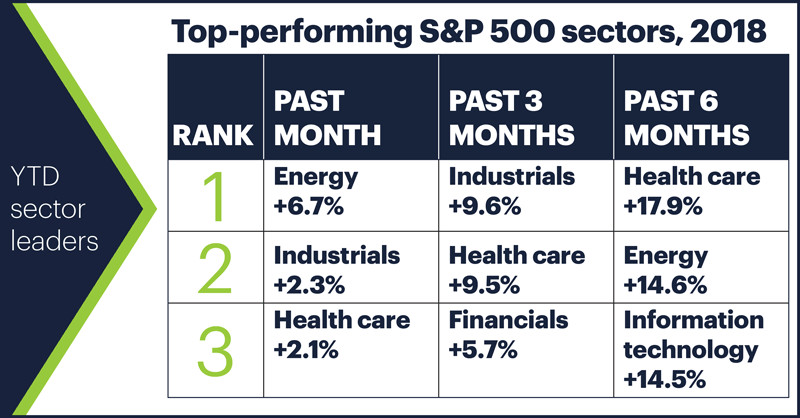 If someone asked you what the top-performing US stock sector has been this year, what would you tell them? That’s not as stupid as it sounds. Long-term investors may define “top” differently than short-term traders, and if you throw in things like “risk-adjusted” or “short opportunities,” you can go down a lot of rabbit holes. While tech made an appearance on the six-month ranking, and consumer discretionary didn’t appear at all, health care made the top three at all intervals. Translation: Tech has been coasting lately, while health care has continued to fight the good fight, just maybe a little below the radar. True, health care has participated in the broad market’s recent retreat, but that may lead some bulls to look for opportunities to buy pullbacks in what has been a consistently strong sector. Those traders would have to decide which ones offer the best balance of reward and risk. There are six industries in the S&P health care sector, and while all of them except one (health care technology) are up one the year, there’s been a fair amount of rotation among them. Life sciences tools & services, for example, is up around 22% so far in 2018, but it’s in the red for the past month and down more than 5% over the past five days. Just as health care has mostly held its ground as the sector rotation winds have swirled around it, at the industry level big pharma has been consistently in the green this year—even over the past week, when both the SPX and the health care sector dropped around 2%. Pharma’s YTD return (around 12%) may only be a little more than half that of life sciences, but it’s also at the top of its sector over the past month and most recent quarter. Strong industry, strong sector—something that may interest traders as well as investors when stocks are pulling back. A return to the upside by the broad market may give health care and pharma stocks another opportunity to pad their 2018 resumes. Today’s numbers (all times ET): NFIB Small Business Optimism Index (6:00 a.m.), Canada Housing Starts (8:15 a.m.). 1 Zacks Equity Research. 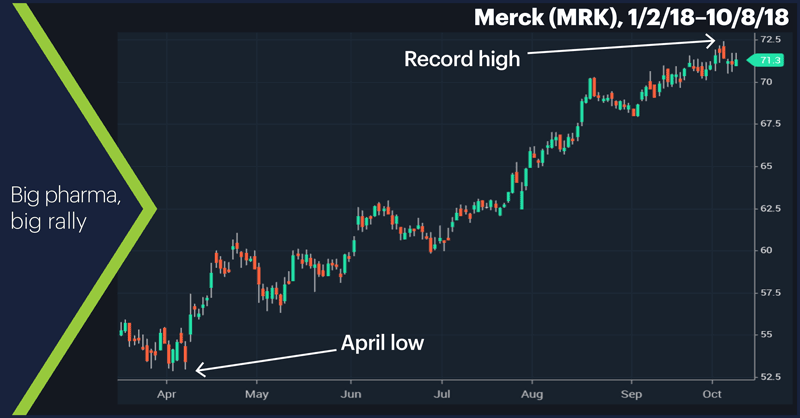 5 Reasons Why Investors Should Bet on Merck (MRK) Stock. 10/18/18. 2 BioSpace. Merck’s Keytruda Nabs Another Approval, This One Under FDA’s Real-Time Program. 8/21/18.